Tired of waiting and waiting and waiting for the final temperature reading? Super-fast, accurate temperature readings – usually two seconds or less! Angry about burning your fingers and hands? Stainless steel probe is 6″; control unit portion is 3″. Total length is 9″ – to protect bare skin. Annoyed at paying $20 or more every few months for a new probe? One complete lightweight unit guaranteed for life – saves money on replacement probes. Irritated about dealing with fragile wires from your probe to your temperature sensor? Unit requires no wires or other unnecessary components for ease of use. Frustrated with trying to get your complicated, “wireless” unit ready to give you temperature readings? Just insert the stainless steel probe in the food and press the “On” button. Aggravated with losing the signal between the sender and receiver for your remote reader? Simply press the “Hold” button, remove the probe, and read the temperature. Dissatisfied with poor instruction books and lack of necessary support? US manufacturer – Clear Choice Cookware – is readily available for any support questions. Resentful about warranties that are non-existent, too short, or aren’t enforced? Full lifetime guarantee to ease any anxiety you may have. 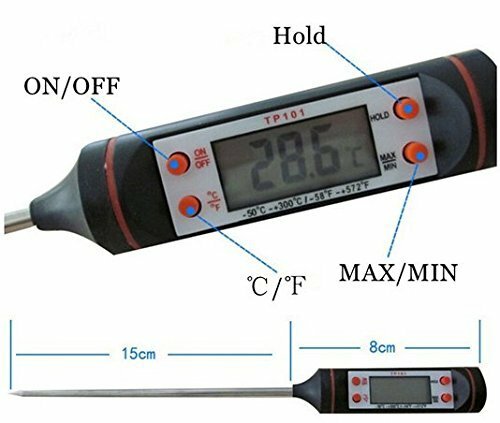 Valuable Tips for Using Your Cooking Thermometer. Tip1 – Your thermometer can be used immediately upon removing it from its packaging. Tip2 – Insert the probe into the food for which you want to determine the internal temperature and press the “On” button. Your temperature result will be displayed very quickly. Tip3 – If you press the “Hold” button, you can remove the probe from the food and see the temperature more easily. Tip4 – When you have finished using the thermometer, press “Off,” or it will turn off automatically after 10 minutes to save the battery. Wipe the probe with a soapy dish cloth, rinse the probe portion of the thermometer only, and dry with a towel. 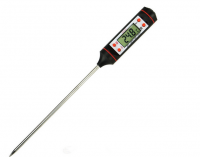 Tip4 – Store your digital thermometer in the plastic container it came in to protect it in a silverware drawer. You can also hang it by the string on a hook on the wall. Excellent for hamburgers, steaks, chicken, turkey, seafood, milk, beer, etc.